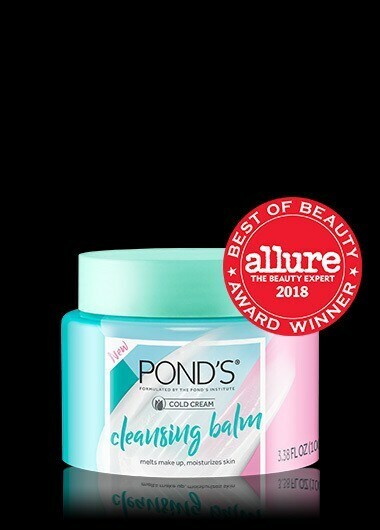 POND’S® Cold Cream Cleansing Balm -recently awarded “Best of Beauty” for skincare in 2018 – is a unique blend of oils and cleansing essence pressed into a solid balm. Once massaged into skin, it transforms into a silky oil, melting away stubborn makeup and removing impurities. After rinsing, skin is left clean, soft and radiant! Leaves skin instantly soft and radiant. Easy Rinse, non-greasy. See what others are saying about this product. Cold Cream Cleansing Balm is rated 4.4 out of 5 by 363. Rated 4 out of 5 by newjerseygirl92 from I found this to be really nice and Engle on my skin. Even with a pretty strong scent it didn’t irritate my eyes at all. It removed all of my makeup except some waterproof mascara. It does contain mineral oil and fragrance so if that’s a concern for you you may want to avoid it. This is a great alternative to a cleansing oil if you travel a lot. It has a similar texture to coconut oil as it is solid and melts down quite quickly but is thinner. This is my first step in a double cleanse and doesn’t leave your skin feeling tight or stripped or oily. It is very balancing and I would recommend but do wish Unilever, the brand that owns Ponds was cruelty free. Rated 5 out of 5 by jacquelynce04d from I was very excited to receive this makeup removing cleanser! I have tried several different products to remove makeup but have ended up settling with makeup wipes that require harsher wiping than I feel comfortable with. As soon as I felt the texture of this balm I knew it would not only be effective, but that I would love it. It feels very similar to coconut oil, but doesn’t get as runny which I appreciate. The ingredient list included “mineral oil,” so I attribute the melting balm quality to that. It gently removed my makeup with ease and actually left my skin supple! This is a product that I will be purchasing once I use up this container! Rated 4 out of 5 by michellez227f from Great makeup remover! It literally melts your makeup off. It’s a balm that has a sherbet like texture that you just massage into the skin to break up long wearing makeup. It worked a lot better than makeup wipes and micellar water. I use it primarily to remove my foundation and lipstick but did not try it to remove eye makeup because I was scared of getting blurry vision. I have used a more expensive cleansing balm but this ponds balm is an affordable alternative. I also enjoyed the light rose scent of the balm. It was pleasant, did not linger and it was not overpowering. I just wish it came with a spatula! It would make it some easier for the ladies with long nails! Rated 5 out of 5 by kaylaw5459 from I’m a third shift nurse so when I get home in the morning after working a 12, I just want to quickly get into bed. But first I gotta take my makeup off! I previously had been using makeup wipes but felt they didn’t take enough makeup off and made my skin dry. I’ve looked into other makeup removers but usually the ones I were interested in were too expensive. I’ve used ponds dry face cream for YEARS for my dry skin and still love it to this day. So when this product came out, I had to try it. And I’m so glad I did! TOTALLY WORTH IT. Takes all my makeup off and leaves my skin soft and feeling hydrated. I definitely recommend and will continue to buy this product. Rated 4 out of 5 by desiraem1 from I have been using this product for about a week now and I really love it. I dont have anything to compare it to as this is my first cleansing balm that I've tried however I feel it really lives up to its claims. I wear alot of makeup and tend to go full glam on the daily! Foundation, powder, bronzer, blush, highlight, lashes, brows...you name it! About a dime size of this product rubbed into a dry face just melts the makeup off like butter. No scrubbing or tugging required. I do follow up with a makeup wipe after and get any eyeliner that I couldn't get to and just go over my face to make sure it clean. I do still follow up with a face wash in the shower though! Rated 5 out of 5 by jessicao17b1 from This makeup removal balm is a game changer. I dread the end of the day for the sole reason that I have to remove my makeup. My makeup removal regime includes various steps to make sure I remove ALL the makeup. I also use a mix of different oils. It’s safe to say I will be switching my makeup removal regime to Ponds Cleansing Balm. It melted the makeup off on the first try. Not to mention my mascara came right off, which is usually the most difficult thing to remove. My face felt moisturized after removing the balm. The smell also reminded me of my childhood since my mom would moisturize with Ponds and therefore I would too.